Methyl Methacrylate (MMA) is a versatile, 100% solids, quick setting (~1 hour) material designed for a wide range of indoor and outdoor applications in commercial, industrial, and institutional settings. These reactive resins will cure in cold temperatures as low as -20º F. They are UV stable and thermal resistant. Whether industrial or decorative, MMA is built to last and easy to recoat. The low-glare, satin finish yields a seamless, high performance coating or resurfacing system with excellent chemical and wear resistance. MMA systems are ideally suited for chemical processing areas, food processing facilities, exterior decks, freezers, refrigerated warehouses, restaurant kitchens, laboratories, machine shops, chemical storage warehouses, animal research facilities, or any project requiring very rapid return to service. Microbe◊BLOK, a factory installed antimicrobial film preservative is available when hygiene & sanitation are critical considerations. 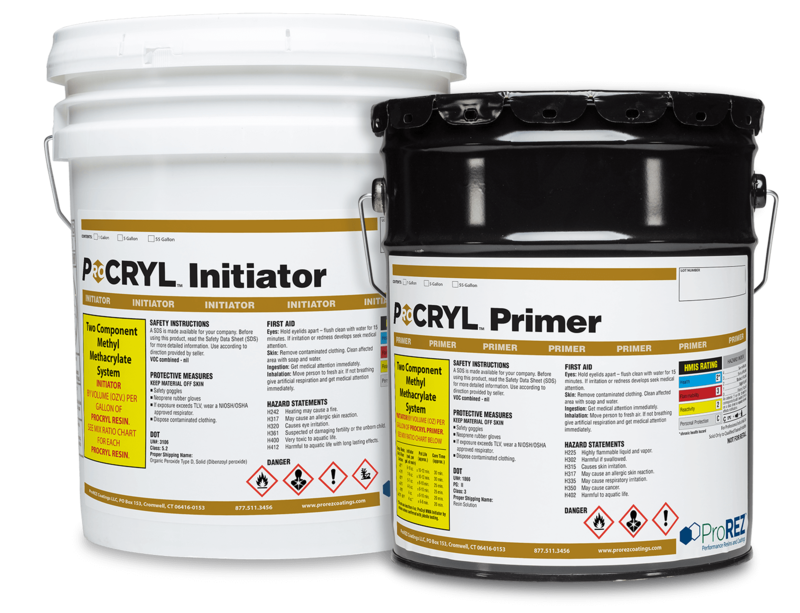 ProCryl MMA Primer is a low viscosity, 100% reactive, methyl methacrylate primer for all of the ProREZ MMA flooring systems. This 100% solids, zero VOC material hardens rapidly with the addition of ProCryl MMA Initiator, even at low temperatures. Fast curing within 60 minutes for rapid recoat. Reference technical data sheet for more information. ProCryl MMA MT Primer is a medium viscosity,100% reactive methyl methacrylate primer designed for priming damp concrete surfaces. 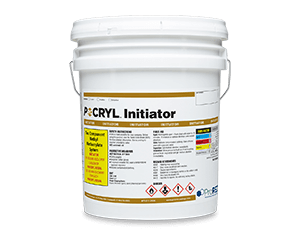 This zero VOC material hardens rapidly with the addition of ProCryl MMA Initiator, even at low temperatures. Reference technical data sheet for more information. ProCryl MMA Binder is a 100% reactive methyl methacrylate high-build binder and bodycoat for self leveling (SL), broadcasted, and troweled mortar (TM) systems. This zero VOC material hardens rapidly with the addition of ProCryl MMA Initiator, even at low temperatures. Reference technical data sheet for more information. ProCryl MMA FX Binder is a higher viscosity, 100% reactive, flexible methyl methacrylate resin that’s available in two versions. For applications requiring a low temperature (LT) waterproofing membrane, pre-treatment of construction and expansion joints, and higher flexibility and elongation in colder settings, our elasticized polyurethane-methacrylate ProCryl FX-LT Binder would be the best solution, both indoors and outdoors. 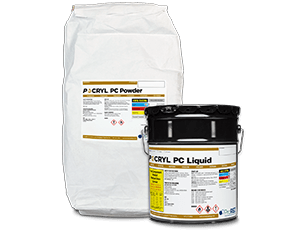 Our standard ProCryl FX Binder is also an elasticized methyl methacrylate resin designed for use as an intermediate or base coat (e.g. broadcast coat) offering stress relieving properties for horizontal slabs showing movement and/or vibration. ProCryl MMA Topcoat is a 100% reactive, medium viscosity methyl methacrylate resin developed as a sealer over ProCryl MMA Binder systems for indoor and outdoor applications. The MMA topcoats include HT (hard-wearing, high strength), KT (semi-flexible, temperature resistant), and UVR (flexible, optimal UV resistance). These 100% solids, zero VOC topcoats harden rapidly with the addition of ProCryl MMA Initiator, even at low temperatures. Fast curing within 60 minutes for rapid recoat and return to service. Reference technical data sheet for more information. ProCryl MMA Cove is a 100% reactive methyl methacrylate paste grade resin for cove base mortars and vertical applications. This 100% solids, zero VOC material hardens rapidly with the addition of ProCryl MMA Initiator, even at low temperatures. Fast curing within 60 minutes for rapid recoat. Reference technical data sheet for more information. 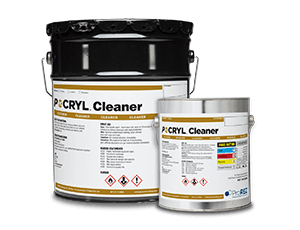 ProCryl PC is a 100% reactive methyl methacrylate based polymer concrete designed for a multitude of applications that require a fast-curing, high strength, material. ProCryl PC is used for thin patches, overlays and grouting, or is filled with coarse aggregate and used for deep patches in slbs. ProCryl MMA Initiator is a white dry powder consisting of 50% BPO, Dibenzoyl Peroxide. The Initiator is what activates the curing or hardening of the acrylic (MMA) resin. Each of the ProCryl Resin Technical Data Sheets contain a mix ratio chart indicating the proper dosage per gallon. ProCryl MMA Initiator must be well mixed with ProREZ MMA resins before adding other fillers and aggregates to ensure the hardening of the mixed materials. Reference technical data sheet for more information. 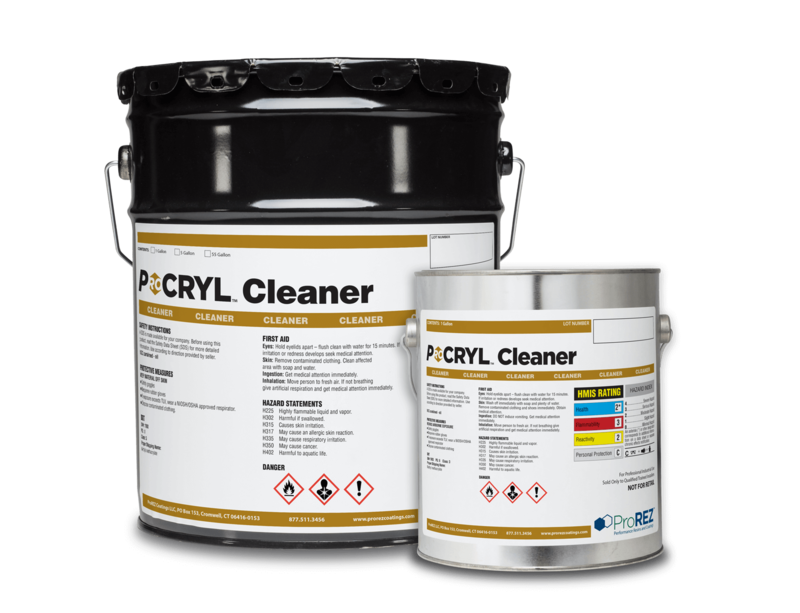 ProCryl Cleaner is a stabilized and inhibited methyl methacrylate (MMA) monomer solvent used for cleaning tools and equipment, as well as existing ProCryl Flooring systems prior to recoat and as a smoothing aid for mortar applications like cove base.